As an agency, we have found that Google Product Listing Ads, now Google Shopping, are one of the fastest growing, and best performing advertising areas for our e-commerce clients. We recommend them to anyone with an e-commerce store. Having said that, like other aspects of Google Adwords, it’s easy to waste money on Google Shopping if you don’t take the right precautions. The ‘set and forget’ mentality is an easy way to waste money on normal Adwords, and we’ve discovered another one: simply ticking a ‘Google shopping feed’ option in your e-commerce platform. Paying too much per click comes about because of the quality of your feed. The price you pay on a click on Google ads is a combination of your bid, and how relevant your product is for the query. The problem with automated feeds which take information directly from your ecommerce store is that they won’t always follow the best practices of Google Shopping, which means your quality will be lower. Say you have a store that sells nothing but running shoes. Your product title might say ‘Adidas Mens’, because the people on your store already know they are looking at running shoes, so you might not specify it. By contrast, your Google Shopping feed product titles need to include the term ‘running shoes’ to help your ad show for relevant searches only. If you don’t, the quality of your ad will be lower, and you will pay more for each click (not to mention the potential waste of money when your ad shows up for irrelevant Adidas searches). Your quality can also be impacted by how specifically you categorise your products – the more specific the category the better – but in some ecommerce platforms this taxonomy can be hard to drill down through. This is the full taxonomy, which can help you choose the best category for your product. Another tip for Google Shopping Feeds is to include ‘item groups’. This way, if you sell one t-shirt in 4 sizes and 10 colours, instead of 1 product, you should separate these out into 40 products. Then each product can have a unique title like “Black Kitten T-shirt Large” and “Green Kitten T-shirt Medium”. This will increase the quality of your feed by allowing it to be more specific to individual searches, but automatic uploads from ecommerce platforms may not allow you to do this. Another problem with automatically uploading your products from your ecommerce platform is the use of flowery descriptions. The elaborate product descriptions you use in your store are not necessarily suitable for Google’s algorithm. Your descriptions need to be more to the point: Elaine would need to write something like “Wool-lined, brown leather Himalayan walking shoes with waterproof rubber soles”. Another way to ensure your products aren’t wasting money is to regularly check your Searched Terms report. In PLA campaigns it’s on the Keywords tab under ‘details’. In Shopping Campaigns it’s on the Dimensions tab. If you’ve been using Product Listing Ads for a while, you might not notice that Google Shopping has been released. Google Shopping campaigns in Adwords are the new version of PLAs, with a few new features – the most useful of which is the benchmark information. Google is now telling you the benchmark cost per click and benchmark click through rates of your competitors. You can also for the first time see your impression share – so that you are better informed on how to adjust your bids. If you haven’t yet, create a new ‘Google Shopping’ campaign today and pause your old PLA. If you have a feed from Magento or BigCommerce but you want to make manual changes to improve it – it’s easy in the Google Merchant Centre interface. 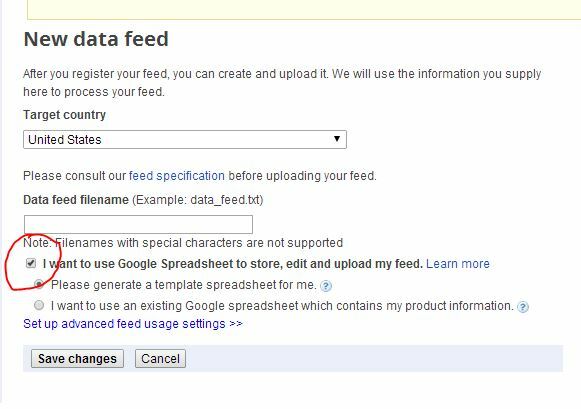 Simply add a new feed, and make it a Google spreadsheet. Google will create a spreadsheet for you with all the relevant fields, and you just input your data – either downloading it from your ecommerce platform or from your other feed in Google Merchant Centre, and pasting it in. Not only that, in the future it is easy to edit it (to improve descriptions, or remove/add products) because you simply open the Google spreadsheet straight up in the browser! Check your ‘searched terms’ report.